I searched through Etsy and found some really cool holiday gifts for both cat loving humans and kitties! I’ve paw-picked some awesome back to school supplies for cat lovers! I have lots of fun Mothers Day gifts for cat lovers this year! I found them all on Etsy. My 2018 Calendar Is Here! Finally, my 2018 calendar has arrived, and I have to say, it is pretty awesome this year! I have some new greeting cards for you for fall! Just wait til you see all my cool Etsy back to school picks for cat lovers! Here is my 2017 Mothers Day Gift Guide for Cat Lovers! I hope you enjoy my picks. Mother’s Day is coming up — so if you feel that way about your human, I have some cool gift picks for you! Check out my new Happy Easter card! Just in Time: New Kitty Holiday Cards! Zazzle is having a big 75% off sale on greeting cards right now, so I added a couple of new holiday cards for you! I have winners for my calendar giveaway – plus a sale! It’s time for a giveaway! 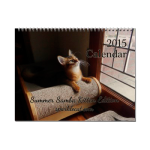 Will you be the lucky human or kitty to win a copy of my 2016 calendars? New Kitty Greeting Cards, Starring Me! I have a couple of new cards up for the holidays – yay! All My 2016 Calendars Are Here! All my 2016 calendars are up and ready to buy! Check out the new calendar of outtakes! My 2016 Calendar Is Here… and I Have Surprises Coming! My 2016 calendar is ready! You can see some of the pages here… and I’ve got a couple of surprises for you! Perpetual Kid is having a sale today, and there are some fun kitty items for you to check out! Talk Like a Pirate… in a Card! Me and my silly pirate costume are on a card now! Just wait ’til you see what it says! Do you know somebody who’s going back to school? Then you should check out these awesome cat-themed items from Etsy! You may even want them yourself. Yes, I Have a 2015 Calendar! My human finally put together a calendar of me for 2015! It’s mostly for herself, but she knows a couple of you out there asked about it. Here are some fun gifts for cat loving humans! And they are all reasonably priced so you will have more money left over to spend on your cats. Binga and No Declaw Graphics at My Zazzle Shop! I have some awesome new products in my Zazzle Shop — check ’em out!